I am not a Facebook fervent user. I use it because of some of my friends are using it. Go to Friends an create a list that you want to chat with. After creating the list, add your close friends. Now, turn on the Chat. 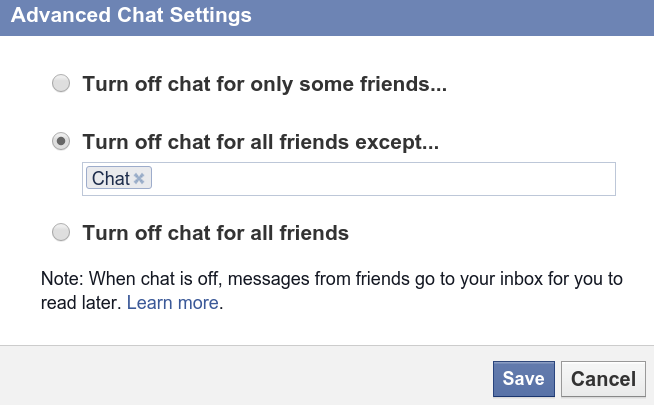 Choose “Turn off chat for all friends except…”, and add in your target chat. Then, if you are using Pidgin, you can use chat with your Facebook friends by following this instruction. Firstly, I want to state that I am totally anti (dislike) Internet Explorer. There are several reasons that I don’t like Internet Explorer. Internet Explorer version less than 9 has a lot of problems with CSS. As a result, as a developer, developing the webpages for among IE and other web browsers is exhaustive. In order to make the compatibilities, the CSS is almost web browser dependent. Besides that, CSS3 which is supported by most of the modern web browsers, does not work well in Internet Explorer. Luckily there is a trick using PIE. But this is not the best solution. The next problem of the IE is the upgrading problem. To upgrade the IE, it is depending on the OS. To use IE8, the Windows must be at least Windows XP. This is not a great problem, because Windows XP is not yet extinct. But to use IE9, the Windows must be at least Windows Vista with SP2 (Service Pack 2). That means, whoever uses the Windows XP cannot upgrade IE to version 9. Next, to use the latest IE10, the Windows must be at least Windows 7 with SP1. That means, whoever uses Windows Vista cannot use IE10. As a result, the users can only choose to upgrade their OS or computer, or remain using old and good for nothing web browser which cannot cope the current web technologies, or lastly change to another web browser. As a developer, to develop the webpages for web browser independent should be easy, because of the standardisation of HTML, CSS, and XML. However, it will be difficult because of IE. Moreover, to develop the webpages for different IE versions is even sillier. If using IE8 and turn on the Developer Tools, we can choose IE8 standards or IE7 standards. This is something interesting, one web browser with two different standards for development. This indicates that webpages for IE10 may different from IE9 or IE8 or IE7 or more. The best reason not to use IE is because there are much more better alternatives: Firefox, Google Chrome, Opera, or Safari. These web browsers are free. Besides that, they are platform independent except Safari. Why do I need to spend extra money to upgrade the computer in order to get a latest OS because of the desire to use the latest web browser? Changing a web browser is cheaper than changing an OS and even more cheaper than change a computer. So, unless IE is cross platform, following W3C standards, and remain free, I will not use IE or develop the webpages targeting on IE. Long time ago, I used to use a text file to collect all my favourite websites. This is because I was using Internet Explorer, and Firefox was not yet introduced. I totally disliked the “favourite” files in IE. Besides that, I cannot bring my favourite websites to any other computers. Then, after using Firefox, I started building up my bookmarks. This is really great because the bookmarks can be easily exported and imported with a single file. Then the social bookmarking sites is gradually prevailing, such as Digg and Delicious. Then we can share our bookmarks with our friends. Next, social networking sites such as StumbleUpon, LinkedIn, Facebook, Twitter, and Google+ become popular. These sites provide the button such as Like, +1, or Favorite. However, feature such as Like or +1 from Facebook and Google+ does not add the posts or links as a bookmark. It provides some statistics for the user who posts, but not as a collection for the readers who like. However, the Favorite and Like in both Twitter and StumbleUpon will store as a collection for the users. Thus, they serve more like bookmarking. Recently, I try to utilise Zotero more. Bookmark is useful to bookmark the page I like. However, sometimes the articles or some phrases are impressive to me. After I bookmarked, I cannot search them from the bookmark, because I only remember a fragment of the articles. Thus, Zotero is very useful in the way as note taking to record the phrases I like. Zotero is perfectly worked with Firefox. The bookmarking and Zotero note taking is able to synchronise on internet. Utilise these features and increase your bank of knowledge. Firefox, though I like it, I still feel a lot of limitations of using it, especially reading the PDF using the plugin from Adobe Reader. This is really a drawback. Because the plugin in Linux I feel that it is not very stable. That is why, normally I open the online PDF with Chromium, because Chromium (Google Chrome) has built-in PDF plugin. Now, Firefox 15 has a built-in PDF plugin as well. By default, it is disabled. So, we need to enable it manually. At the address bar, enter “about:config”. Then you are able to edit some configurations of the Firefox. So, search “pdfjs.disabled”, change the value to “false”. Yes, now, it is enabled. I forgot whether restart is required or not. Just try any PDF, then you will see the difference. However, if comparing the viewing quality with Chromium, the text in Firefox is quite rasterised (pixelated). Yet, I am still enjoy with this new feature. Yes, again web browser. I am using Firefox. Only sometimes Chromium (Google Chrome). Mainly Firefox. If someone ask me, which one I choose, I definitely answer Firefox. But, if someone ask me, which one I prefer, then it will be difficult to answer. Firstly, I would like to go through why I choose Firefox as my primary web browser. Because of DownThemAll. There is no alternative extension in Google Chrome like DownThemAll. Why I like DownThemAll so much? I use DownThemAll with GreaseMonkey to download my favourite mangas (comics). This is something Google Chrome still cannot do it, based on my current knowledge. GreaseMonkey generates the links, right-click, then I DownThemAll. Another two addons, DownloadHelper and FlashGot. Both of them allows me to download any online video or audio streaming. Google Chrome doesn’t have this type of extension. Actually, all of these limitations of Google Chrome are because of extension API restriction. That is why, there is no similar replacement for DownThemAll, DownloadHelper and FlashGot. However, I wonder why there is no one uses NPAPI to build the similar extension in Google Chrome. Then, if I definitely choose Firefox over Google Chrome, why do I need to post this blog? Sure, there is some beauty about Google Chrome which always makes me to consider to switch to it. Firstly, its interface is really clean and simple. The interface make me feel more to the webpage instead of web-browser. Firefox makes me feel that I am using Firefox; Google Chrome makes me feel that I am visiting the websites. Secondly, for the developers, creating extension using Google Chrome is super easy comparing creating a Firefox addon. Firefox addon needs to follow a lot of convention and using XUL, which is not easy to learn (for me). It needs to create “chrome.manifest”, “install.rdf”, and so on. The documentation is also not very good (I personally feel). Thirdly, Google Chrome has Chrome Web Store, this is something which Firefox lacks of. But even if there exists Mozilla Web Store, I will not prefer it, unless the Mozilla Web Store is a superset of Chrome Web Store, then I may like it. Then, there are several other reasons, such as Google Chrome open and close is faster than Firefox. Though Firefox startup is far more better than its older version, it is still slower than Google Chrome. And if closing the Firefox, then you want to start the Firefox again, you need to wait a while. Besides that, enable or disable the addons needs to restart Firefox also. May be this is the price paid for the good addons like DownThemAll, FlashGot and DownloadHelper. The current development stage is alpha, and targeted only on one website, since the other websites I frequently visit still work with Greasemonkey userscript. The alpha stage of Comic Downloader is currently work in command-line. GUI feature will be added in future with PyGTK. Currently, the command-line is able to solve my problem for offline comic reading. Feel free to visit the project page.